Happy First Birthday, Renaissance Dad! 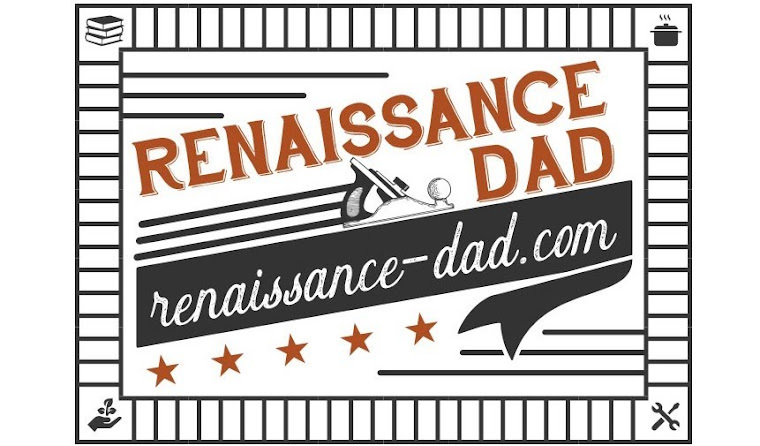 It is very hard to believe, but Renaissance Dad turns one today! It has been a wonderful year of building, gardening, cooking, and blogging. Here are some statistics on the past year. Personal favorite article to write: All of them (yeah, this is probably a cop out, but I have enjoyed every article, especially the ones that my kids helped me write). Thank you all of the support over the past year. I have thoroughly enjoyed walking this road with you, and I look forward to seeing what happens with Renaissance Dad in the next year. When I moved from teaching into educational administration, I had no idea how much time I would end up sitting at my desk. While I try not to be at my desk too often, but rather spend time with the students, there are often times when I am stuck at my desk for the better part of the day. Combine that with using a lousy chair, and my back started screaming at me. I figured it was time for a change. I have a good friend who is also an administrator, and he talks regularly about his stand up desk. I figured I would look into it, and very quickly realized that I could not afford any quality desk. I did some more searching and found several websites that touted inexpensive, DIY stand up desks. Most of them pointed to the same desk that I created, but I added something that makes it fit like a glove. The project consists of about $25 worth of IKEA parts (I tried to find the origination of the design, but every website seemed to think that they came up with this. I don't claim to be that savvy, but unfortunately I cannot give credit where credit is due). It is made from a Lack Side table (about $10 depending on the color, available in 12 colors), 2 Ekby Valter 11" shelf brackets ($4 each), and an Ekby Viktor shelf ($6). Since my desk at work is black, I got all of the pieces in black to match. If your math is good, this comes out to about $26 (including tax), which is better than buying a $700 stand up desk. If your math is bad, this comes out to $1000 which is a complete rip off for having to build your own desk. Note: for those of you who do not live close to an IKEA, you can either have the parts shipped from IKEA, or you can order from Amazon. While Amazon carries all of these parts at the time of this post, they are more expensive than purchasing directly from IKEA. The table top holds the monitor, and in my case, the laptop, with plenty of room for both. The brackets attach to the table legs and hold the shelf for the keyboard and mouse. The Lack table is 21" wide and the shelf is 29" wide. If that extra 8" bothers you, you could cut the shelf down to size. However, I have found that the extra width makes the shelf wide enough for a keyboard, a mouse, and a cup of coffee, with maybe just enough room for a doughnut (after all, you're burning more calories by standing, so you can justify eating a doughnut while standing at your desk). Now comes the individuality of this design. While many people have this desk and describe the ideal height of the keyboard based on one's height, everybody is a different fit and I wanted to find what worked best for me. For the first three months that I had the desk, I used zip ties to hold the shelf brackets onto the table legs. I then used CDs to adjust the height of the shelf brackets, adjusting the keyboard shelf up and down one quarter of an inch at a time. I would keep the keyboard shelf in one position for a day or two, and then add or remove a CD to see if it felt better by the end of the day. Once I was convinced that I had the right height, I screwed the brackets into the table legs and screwed the shelf into the brackets. Do you know what the best part of this is? No, it wasn't the strange looks that all of my coworkers gave me the first month that I stood at my desk (although I think that they all now realize I am bizarre. The salt lamp by the desk enhances this bizarreness). The best part was that my lower back immediately loosened up. I have had very little lower back pain since I started using my stand up desk. Please know that I am not a doctor and I make no claims that this stand up desk will cure any back problems that you may currently experience. But for me, this is pretty close to the best $25 that I have ever spent. If you end up making a stand up desk for yourself, I would love for you to leave a comment letting me know how it works for you. One of the things that I love about winter is having a fire in the fireplace. Yes, I do live in Arizona. Yes, Arizona is a desert, and the winter we have here is not like the winter that I used to deal with in Illinois. Yes, we complain about temperatures in the 40's. But you know, having a fireplace makes 40 degrees that much easier to deal with. There is something magical about a fire in the fireplace on Christmas Day. On New Year's Day. On Boxing Day (I'm not sure what Boxing Day is, but this is a shout out to my Canadian readers). Huddling around the fireplace while reading books or watching a movie has become a favorite winter pastime in my house. Last week, after the kids were in bed, I started a fire in the fireplace. I always check to make sure the flue is open, which it was, and I lit the fire. Within seconds, smoke began to fill our house, eventually setting off the smoke detectors. Remember the part where I said that the kids were in bed? This eliminated that. Little E began shrieking in fear. Big A came barreling out of her room to see what the crazy noise was. Meanwhile, Big E was sound asleep, probably dreaming of being a firetruck driver. Our smoke detectors are hardwired, so to override them I actually had to dismantle and un-wire them. When the commotion finally died down, the kids were back in bed, and the smoke had cleared, I was left wondering what had caused the smoke to back up into the house. I then realized that we had never had our chimney cleaned in the two years that we have lived in this house, and I have no way of knowing if or when it was cleaned before we moved in. I had no idea what caused the backup, but I didn't want neglect of the chimney to cause a fire in our house. I contacted a local company, Arizona Chimney Sweep,who came out and did a thorough clean and inspection of the chimney. When the technician arrived, I made sure to shake his hand, because, after all, I learned from Burt the Chimney Sweep that "good luck will rub off when I shake hands with you" (free bag of Gatorade mix for the first 10 people who get this reference. But you'll have to come to my house to pick it up). I would have been content with just the handshake, but I decided to let him take a look at the chimney. After the cleaning and inspection, he gave me some great advice as to what I could do to prevent further backups of smoke into our house. So my two takeaways from this experience were to first of all have working smoke detectors located throughout the house. This seems like a given, but I want to make sure that all of my readers are checking to ensure that they are safe. The second take away is to check the chimney and have it inspected and cleaned. It is relatively inexpensive and can help keep your family safe. And finally, enjoy a wonderful fire in the fireplace after all is said and done.